Converting DICOM to NIFTI with Checkpoint is a short and simple process. 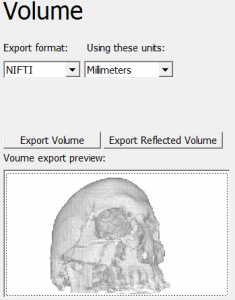 Load a DICOM volume, then go to the “Export” tab. Under the volume section, select the NIFTI file format from the list provided in “Export format”. The “Using these units” attaches new units (i.e. mm, m, etc.) to the exported volume. Click the “Export Volume” button, then select a directory and a name for the NIFTI file and click ‘Save’ to export.